I used to make a resolution every New Year's Eve... usually something like those I've mentioned above... quit drinking, smoking, fighting... whatever. None of them ever really came from the heart. They were promises made because that's what you do at New Years, right? A resolution is almost mandatory, a way to look toward the future with a promise to personally make it better somehow yet does anyone truly believe in their New Year's resolution? I know I never did. I'd make those resolutions (usually while under the influence of alcohol or drugs or both) and I always broke them, often within 24 hours. It's no mystery why I broke the promises I made to myself... I didn't believe in them anyway. It was just the thing to do on New Year's Eve. Everybody was doing it and almost everybody was breaking them early in the new year. Breaking my New Year's resolutions shouldn't have bothered me. I always knew I was full of crap making them so why should I care if I broke them by doing what I resolved not to or ignoring the lifestyle changes I'd resolved to make? But I did care. It always bothered me... year after year after year. On Dec 31, 1979 I resolved to never again make any New Year's resolutions. That was the only resolution I ever kept. The only one I never broke. If you have a problem keeping the promises made under New Year resolutions maybe this one is for you too. I'm not saying don't want to improve yourself and your life, not saying those aren't great and noble things to strive for. All I'm saying is don't anchor yourself to one singular date to do it. Don't wait for New Year's Eve to make those resolutions, just get started whenever the time is right. Mark the passing of one year to the next however you want, party as much as you need or desire (or don't) but forget about promises made on New Year's Eve. A real promise to one's self comes on its own time. Tis the Season to be... What, exactly? Have you ever stopped to wonder what Christmas means to people... even what it means to you? I know a lot of people will answer something about Christ's Birthday, or it's a "season of giving" or maybe a "time when family and loved ones connect" and it might have been one or all of those things once but I wonder if that's really what Christmas means to people now. I wonder if people really know what Christmas means to themselves anymore. My wife and I no longer celebrate Christmas. We don't get a Christmas Tree, decorate out apartment or exchange gifts. For us Christmas has become something to endure... crowds, store closures, the falsity of people who act anything but charitable towards others at any time of year but especially Christmas. The memories of people and things past which alternately reawaken aching loss or rekindle searing heartbreak. It wasn't always that way. Both of us come from families where Christmas was a time of gift-giving, celebration and family get-togethers. The religious aspect of it was noted and moderately followed but mostly Christmas was about getting together with family. For me it was always a strange time. I liked the gift giving (and getting) but always felt my own family - my parents & siblings - rarely had any real time to ourselves aside from a few short hours Christmas morning before all the visiting and extended family stuff started. And that family stuff... Wow! As a kid I felt it strange seeing people who didn't necessarily get along all year suddenly become close at Christmas time. (At least until the booze started really flowing anyway, then the real fun stuff started.) For the most part, family feuds were put on the back burner for Christmas... a truce of sorts brought on by the need to honor the spirit of the season by forgiving (at least temporarily) all the various slights, insults and character traits exhibited by and between various family members the rest of the year. Raised on my family's example, I believed Christmas was a time to let go of old grudges, a time of forgiving. As I understood it, Christmas was when everyone in the family worked to put differences aside and come together in solidarity and peace to celebrate making it through another year. I believed those same principles applied to people outside our family as well. Christmas was a time to be a little more charitable, a little more forgiving and tolerant and a little more pleasant to others be they friends, neighbors, casual acquaintances or complete strangers. My wife's family had similar Christmas experiences and values and I think most everyone else did also. I think back then most people still believed in and practiced the time-honored Christmas values of forgiveness, tolerance, acceptance and patience toward others. It wasn't hard to find evidence of that. During the Christmas season people everywhere were more accepting of others' behaviors (and more polite to strangers) than at other times of the year. At Christmas people showed real gratitude to those stuck working during the holidays and everyone tried a little harder to get along. Back in those days even the people who didn't do or believe in Christmas showed those same values toward those who did celebrate the season. Nobody got bent out of shape over a stranger wishing them "Merry Christmas", school Xmas pageants, Christmas trees on government spaces, Santa Claus or any other Christmas traditions or accompaniments. If they did, they kept their opinions to themselves... didn't spoil the fun for everyone else. Where are those Christmas traditions now? Where is the collective respect towards our fellow man... the tolerance, patience, acceptance and love shown not just to family and friends but complete strangers? Where is that Christmas spirit found in the new holiday traditions of me-first entitlement, indulgence and greed? Just what the heck are we as a society celebrating anymore? Why do we even bother keeping Christmas a holiday anyway when for most people it's all about themselves? Why close the stores and shopping centers if all it's about is buying stuff... usually for ourselves... instead of doing stuff for others... of giving strangers a helping hand (or parking space)... of tolerance, respect, kindness and love toward your fellow man? We have pushed Christmas (and God) from most of our schools, government and public places. We have created a society where wishing someone a "Merry Christmas" may be considered offensive... where Presidents and Prime Ministers call Christmas trees "Holiday trees" so as not to offend those whose beliefs or faith systems don't recognize Christmas. We are driving Christmas - a time that used to be about recognizing, strengthening and glorifying the bonds between us - underground. We are making the best of our nature into something vile and offensive while at the same time treating one another in the most offensive of fashions with every trip to the mall. Whatever happened to being nice to each other? What happened to being polite and respectful to strangers? Why do we lose patience with each other sooner and with more negativity at Christmas than any other time of the year? Why are we as a society and as people "celebrating" Christmas by turning more and more toward the antithesis of what it stands for? Just what are we celebrating, exactly? This isn't a regular blog entry. I'd like you to take a moment and read an entry in a blog belonging to someone else. I think it's message is important and shouldn't be lost among the scads of other blogs, internet posts, Tweets and mainstream media stories and coverage about the events that spurred the writer to post it. Those "events" are the recent school shooting and subsequent deluge of media & internet commentary. My job at the quarry - the actual job... the stigma of working at a place many people believe (erroneously in my opinion) to be a detriment to the environment... the uncertainty of lay-offs and my struggle to remain at work in the face of looming unemployment... the physical toll on my body... the personal dynamics of the quarry workforce... the birds and animals I see there. Oh yea, there are LOTS of things worth writing about. The above ideas are just a fraction of blog-worthy fodder in my mental rolodex. I have a number of topics lined up that I definitely plan to write about and new inspirations come every day. There is no easy answer to that. It's not like I haven't had the time, the energy or the will to sit down and write. I have. What's stopping me from adding new blog entries at every opportunity is my own state of mind. When I look at the urge pushing me to write about something, like driving, for example, a big part of my desire to write is born of negative emotion... anger and frustration. Like, I want to rant about driving and the people I share the road with. Ranting about things is very easy and can make for some entertaining reading but I have to ask myself if that's what I want to do... if ranting in full sarcastic and cynical mode is the right thing to do. As fun as it can be in the short term, is it something which will stand the test of time without regret? Will writing in a negative bent help me achieve balance? I already know that it will not. I have discovered negativity is easy, a self-serving, self-sustaining way of thinking which can cloud one's appreciation for life. I have no wish to write from a negative point of view even if by necessity I must write about negative things since so much of the human condition embraces that easier path. If I'm to write about anything I must endeavor to do so from a place that is free of my own negative feelings and bias. When I restarted this blog I pledged to remain honest and truthful. The truth is I have struggled with negativity most of my life... spent years embracing it in the way I looked at the world and everyone and everything in it. I have come to realize negativity is at its core a very arrogant way of looking at things... a self-centered "me first" mindset which allows one the luxury of side-stepping personal responsibility for their life, their actions and their emotional state. Negativity's mantra is "Life's not fair." Believing that causes one to react to everything that doesn't fit their way of thinking (or their wants, needs and opinions) as a personal slight against them. They get upset about things that really aren't about them at all. Life is not fair or un-fair. Life just is. Man is the only living thing which questions life, the only living thing that believes it deserves to be alive. I wish to write about life, including the inherent negativity Man brings to it, but I don't want to be negative while doing so. I don't want to look back at my blog entries with regret. There is enough negativity in the world already. I have no desire to add any more to it. Here for a good time? That got me to thinking about the phrase "here for a good time, not a long time" and how often it's cited as validation for personally gratifying behaviors. Like, because our lifespans are relatively short - maybe even tragically so - it's important to have a good time while we can. Many people truly believe that and rank having a good time high on the list of things they need to do. Gotta have a good time today because we may not be here tomorrow. I know I sure used to think that way. When I was in my teens I didn't think I'd live to be thirty so I was always searching for ways to have a good time. When I actually reached that age I merely shifted my supposed termination date to somewhere before forty (No way I'm makin it to forty.) and continued my search for a good time because after all... we're not here for a long time, right? I mean... Everybody knows that. "We're here for a good time, not a long time"
Having a good time isn't necessarily a good thing. I know a lot of my good times often left me feeling anything but good when they were over. Hangovers, bruises, regrets... Those are just some of the residual affects of me having a good time. I'm sure others wouldn't have to look too deeply into their own lives to find their good times often came with side-effects of the not-so-good kind. IT COULD ALL END TOMORROW! I still think we're here for a good time, not a long time. I truly believe that is the way to live one's life but NOT because we're here for a short time. I think it's the right thing to do no matter how long we may or may not be here for. The difference between the way I look at being here for a good time now isn't the way I used to look at it. I don't think interpreting "a good time" to mean "having fun" or any other personally indulgent behavior is what the ideology (or way of life) that phrase espouses is all about. I think it's about something entirely different... something that won't leave you with a hangover. What if being here for a good time means being good? What if, instead of devoting one's life, health, energy and mindset to the pursuit of personal gratification and enjoyment (having FUN) and calling that "good"... we devote our lives, health, energy and mindset to being good? The more I think about it the more I realize how wrong I was thinking life was all about me having a personally indulgent FUN time... how I rationalized that self-centered belief by thinking I deserved it due to the fact I won't be here for a long time - maybe not even tomorrow. I understand now that interpreting "good" to mean "fun" can be a road to a lifetime of empty promises, a pursuit of soulless gratification which ultimately means nothing no matter how long or short one's lifespan may be. I've never really pondered the meaning of "A bird in the hand is worth two in the bush" since I first heard the phrase years ago. I don't remember where or when exactly, maybe in school, but I do know I always agreed with the general consensus that it was about the folly of greed and how wanting more of something can lead to having less of what you already have... and I'm not writing this blog today to argue any differently or even to talk more about that old adage except to say the reality of having a bird in hand was to me, priceless. I recently had a bird in my hand. A few different birds actually and the experience was... amazing. It happened a couple days ago on an outdoor walk with my wife and dog, one described in some detail in the preceding blog entry Neither my wife or I can recall ever having wild birds perch on us (with the exception of some Stanley Park pigeons which hardly qualify as "wild", at least by my reckoning.) We do a lot of exploring in the wilderness areas around Hamilton and birdwatching is a huge part of the activities we enjoy. As a result we've seen a lot of birds but before that magical day at the Hendrie Valley Sanctuary none of those birds we were watching ever landed on us. Nearby maybe but never actually on us. My wife was the first to have a hands-on (on-hand?) experience with a bird when a chickadee alit on her upraised palm. It stayed there only a second, barely long enough for us to grasp that a bird had actually landed on her! We were both elated but she was ecstatic at what just occurred. Seeing her look of wonder, amazement and joy nearly melted my heart and I was disappointed about not getting a picture of the magic moment which induced it. I had my 300mm lens on and was standing beside her, way too close to enable a shot even if I had been able to raise my camera to my eye before the chickadee took wing again. 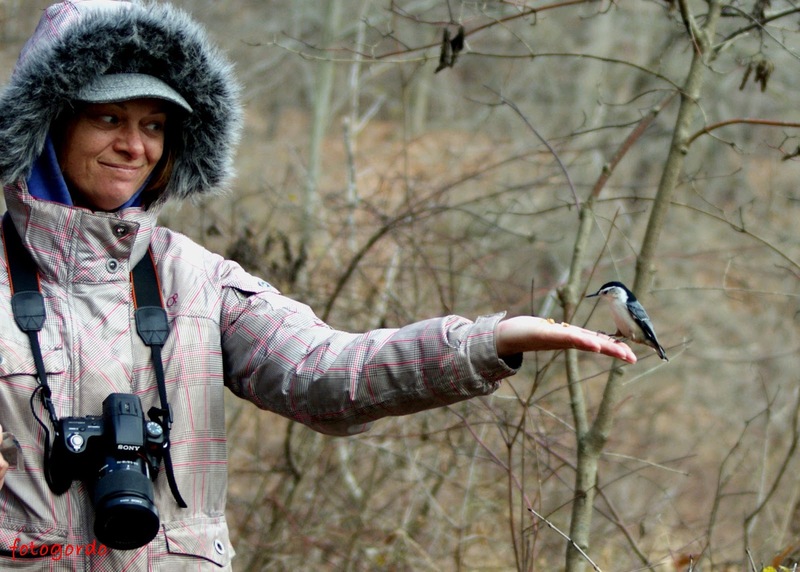 It was an indescribably awesome thing to watch and photograph my wife hand-feeding the nuthatch and chickadees. She was so happy, completely enthralled by the little feathered creatures jumping from bush to bush, branch to branch as they approached, flying around her, hovering over her, perching on her! I was also enthralled with wondrous joy watching her experience this first-in-a-lifetime event. Seeing my wife surrounded by and interacting with those birds was deeply moving on an emotional and spiritual level. My happiness at what she was experiencing during those bird-filled moments provoked an awareness of how deep and strong my love for her is. At the same time came a clear and true spiritual realization - miracles don't just happen, they exist. The actual physical sensation of a chickadee landing on my hand was very light. Aside from a slight tactile sense of its feet touching my skin there was no evidence I could actually feel. I had no sense of the bird's weight when it landed on me. Take-offs sometimes brushed air across my hand but there was no feeling of any weight being lifted. Chickadees aren't weightless of course (1/3oz or 9-12grams according to easily-Googled literature) but they're so light they might as well be. Even the relatively larger and heavier white-breasted nuthatch's weight (20 grams or so) barely registered... although their take-off launch did shove against my finger with enough force to indicate separation between us. The touch of the birds was so light I have to wonder if I were blindfolded, unable to witness by sight the wonder of a bird in the hand, would I know they were landing on me at all? Actually seeing a chickadee perch on my fingertip was truly amazing. Awe inspiring (even if in the photos I look a little less than awe-struck. Bifocals, folks. In order to see the birds in clear focus I had to tip my head back.) I couldn't look at that bird perched on my finger without concluding I was witness to a miracle in the happening. 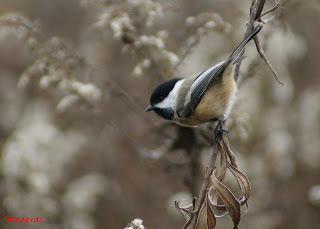 When I realized the chickadee was looking back at me I knew for sure. In that moment I sensed the connection... the spiritual bond that binds everything together... the singular energy source within every atom and the space between. Some truths are too large in scale for anybody to grasp. 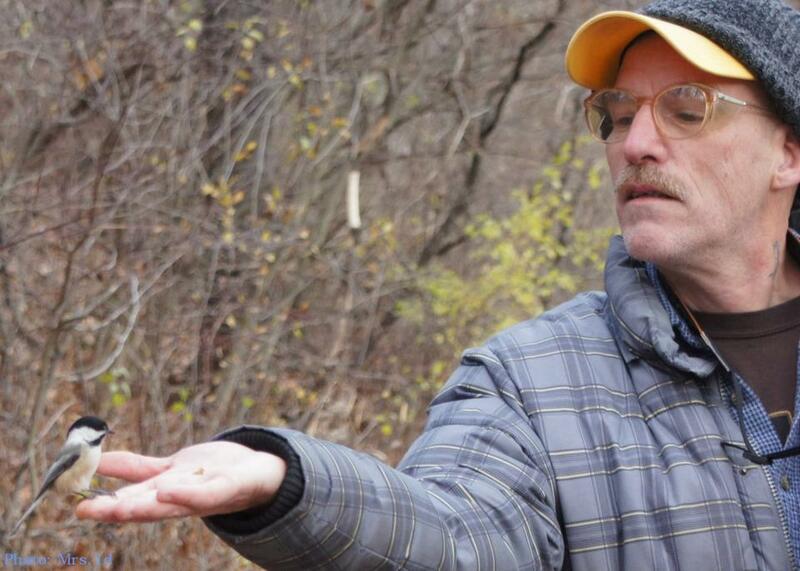 I gained just a whisper of real knowledge framing the moment I and the chickadee in my hand assessed each other... the barest glimpse of truths beyond the understanding of mankind. I don't know if there was a message or lesson in that moment for the bird but for me it came down to this: I am you and you are me and we are all together. There's more to it than that of course but that's the feeling I got during that moment of bird-in-hand. I didn't think it. My thoughts at that moment were more akin to something like "Wow! This is AWESOME!" And before any of my regular readers start thinking I'm off on some kind of God and faith sermon... relax. This isn't about that. I'm not preaching anything. I don't think the bird was some kind of messenger of God. This bird, and all the other birds I saw that day including the ones who didn't fly over and land on my hand were just birds. The bird wasn't looking right at me like the American Kestrel I spoke of in an earlier blog. The little chickadee was looking at me like he was just checking me out, comparing me visually perhaps to other humans encountered in its past. When he was done that he grabbed a crumb from my palm and split. Anyway, the point is seeing the bird in my hand was evidence of a miracle. 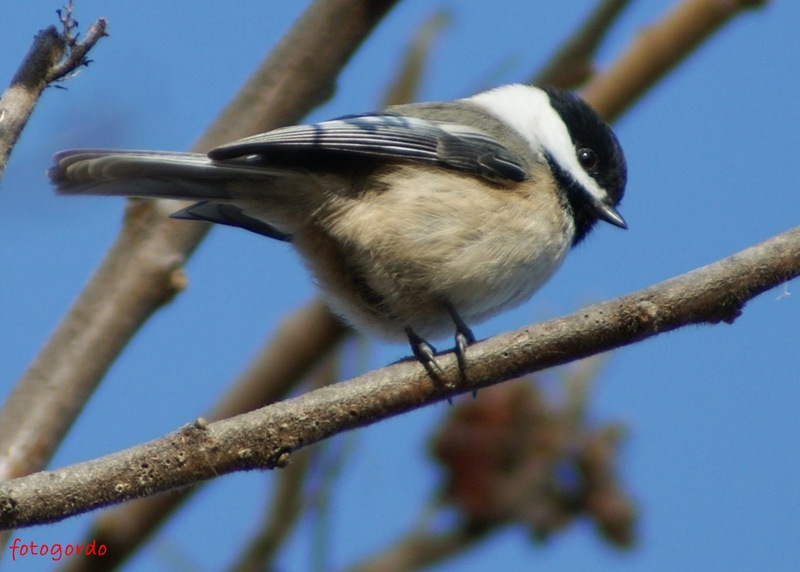 That a chickadee even exists is a miracle. And if it's a miracle then I'm a miracle... and if I'm a miracle then you are a miracle also. What, you don't believe in miracles? Too bad. Not believing in miracles is like seeing the world from the inside of a windowless bus. I know. There was a time when I didn't believe in miracles. Now I do believe. I believe they are everywhere all of the time. Miracles are within us, all around us. We just don't see them for what they are because we as a species have blinded ourselves to their existence. You are but one of over 7 billion humans alive today. And all of them (you & me included)... the entire human race equals an almost immeasurable fraction of the collective biomass of organic species clinging precariously to life on the thin crust of a planet 12,600 km wide, a planet traveling 107,000 km/hr around a star 100 times bigger. And that star is traveling around a galaxy with 200-400 billion other stars and it is spinning through the universe among an estimated 100 billion other galaxies. here you are. Is that not a miracle? And maybe... just maybe... believing in miracles. Yesterday, Friday Nov 23rd, the weather was awesome but weather forecasts called for an abrupt change to colder temps and stormy skies, even possibly snow to the Southern Ontario region we call home. My wife Tammy, our chihuahua Isabeau and I had been enjoying the warm weather and sunny skies all week with daily adventures at a range of our regular haunts and favorite places. We'd explored Bayfront Park, the Princess Point / Cootes Marsh trails, even a couple walking excursions around our home neighborhood and Hamilton's downtown core. With colder temperatures and snow in the forecast for the Saturday I wanted to take full advantage of Friday's awesome weather by adventuring in an area new to us and decided we'd go to the Hendrie Valley Sanctuary. 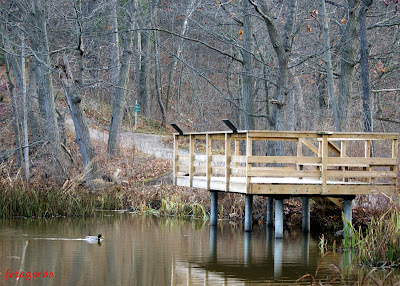 The Hendrie Valley Sanctuary is owned and maintained by the Royal Botanical Gardens. It's located near their main visitor center and garden displays area just outside of Hamilton's borders in the adjacent city of Burlington. We accessed the park from a lot on Plains Road West near Botanical Drive (Map) but there are other points of entrance available. As usual at RBG owned areas parking costs $1 an hour so we were expecting that but it was a pleasant surprise to discover the ticket machines accept the new 2013 loonie coins and somewhat surprising to discover there was no daily limit (usually $5) and the Valley was open to visitors 24hrs. 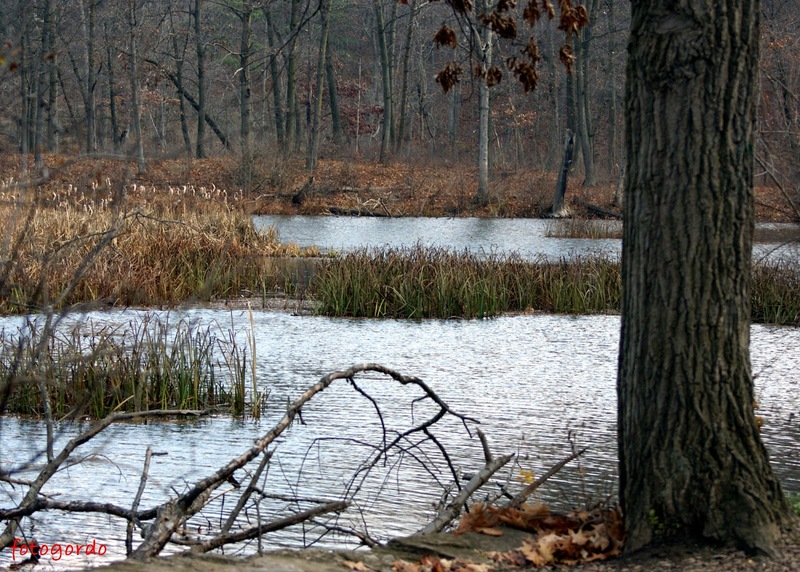 The Hendrie Valley Sanctuary is a 100 hectare wilderness park that is considered by the province of Ontario as an Area of Natural and Scientific Interest (ANSI). 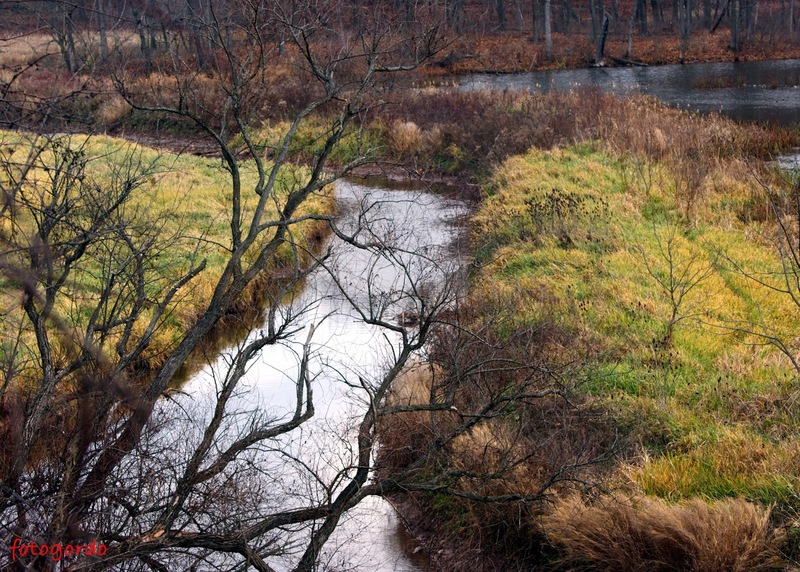 It contains a 50 hectare Marsh fed by Grindstone Creek and lots of forested slopes and ridges. The Valley and wetlands within (which apparently drain a 90 square kilometer area) is also considered an Environmentally Sensitive Area (ESA) because it contains many rare and endangered native plants, fish and other species. Some areas and trails are closed to better protect the environment but there is still lots to see and experience. Trails through the park are sometimes hilly but almost always wide and smoothly surfaced. It can get wet and muddy in some spots so appropriate footwear is advised. On the valley floor there are elevated wooden walkways which give park visitors a great vantage point to enjoy the wetlands and creek without impinging on the natural flora and fauna. Trails are well marked and many contain Family Activity Panels at various points of interest. 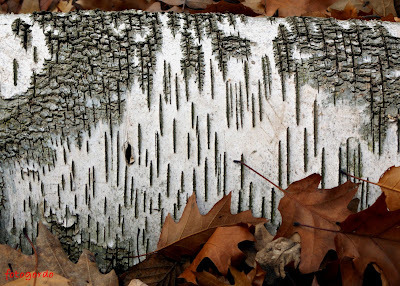 The colorful panels usually have 4 nature-based questions and exercises which encourage young park visitors to learn more about the area and its natural denizens by engaging in hands-on challenges and activities like 'touch 4 different kinds of trees to see the difference in bark' or 'find a caterpillar'. There were a few family groups at the park on Friday and they all, kids and adults, seemed to be enjoying the Family Activity Panels. It was apparent as soon as we entered the Hendrie Valley Sanctuary trail system via the Cherry Hill Gate that one activity regular park users enjoy is feeding the resident squirrels. The park is home to Eastern Gray Squirrels and their Black cousins. Both species seemed totally unconcerned about Isabeau or us posing some kind of threat. To the contrary, the squirrels approached us willingly and only got wigged out after realizing we had no food to offer them. Not that they needed any! 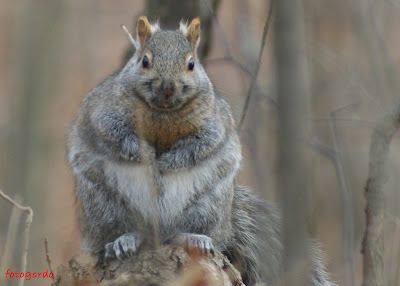 I don't think I've ever seen so many squirrels so fat before. These guys are definitely not hurting for a meal. There were more Gray Squirrels than we normally see and they had some interesting physical traits not common to the Gray Squirrels we see elsewhere... These Hendrie Valley Gray Squirrels had white-tufts of fur behind their ears. It's a feature found on many Gray Squirrels but not as pronounced and common-to-all as it was on the ones here. Another interesting easily observable difference the park Gray Squirrels had from squirrels in other areas was the length of their tails. The Hendrie Valley squirrels have shorter than usual tails. Even the park's Black Squirrels had shorter tails than usually seen on these species. I assume it's some genetic trait within this community of squirrels that accounts for the physical differences between them and squirrels elsewhere. Whatever the reason, it doesn't impact their ability to gain weight and certainly doesn't negatively affect their cuteness factor. We had a great time at Hendrie Valley Sanctuary. I love exploring areas for the first time. Every step, everywhere you look there are never before seen wonders and this park is full of amazing natural beauty. At this time of year with most leaves carpeting the forest floor instead of on the trees it was possible to see vistas and forest views unavailable in the spring. There are multiple ponds along Grindstone Creek as it winds and curves across the valley floor on its way to Lake Ontario. Views from the trails were awesome (thanks in no small part to the absence of leaves) but there were also spots where platforms were provided allowing park viewers an unobscured view. As always we were hoping to see birds and the Hendrie Valley Sanctuary gave us a birdwatching experience like we've never had before. We spotted our first bird just moments after entering the park, a large Red-tailed Hawk cruising through the treetops in a glen to our right which put it almost eye-level with us. Less than a hundred steps later when we paused to shoot photos of a particularly fat Gray Squirrel we were suddenly surrounded by a mixed flock of Dark-eyed Juncos and Black-capped Chickadees. With them came a White-breasted Nuthatch which was the first of my many "Wow!" moments that day. That initial group of birds was very casual in their approach, a behavior which repeated numerous times with other birds we encountered in the park on our visit. The feathered denizens of Hendrie Valley are obviously comfortable and conditioned to the presence of humans and dogs. That the smaller birds in the park had no fear of humans was made even more apparent as we traveled deeper into the trail system. The Chickadees and Nuthatch's were especially bold, often following us as we walked along the creekside trail, sometimes even cruising past us only inches away or perching in branches directly overhead. 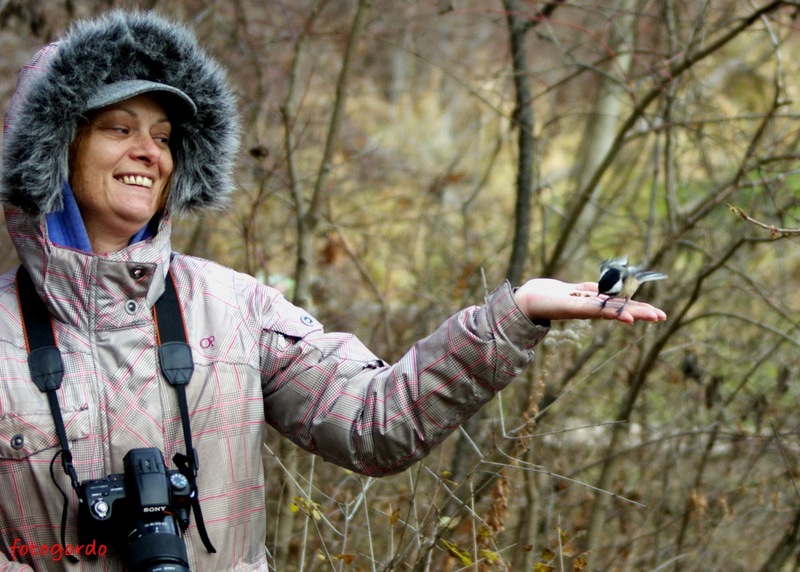 On a whim, Tammy offered an outstretched open hand and to our delight and astonishment a Chickadee flew down and perched on her fingers. It was an amazing. Until that moment a wild bird had never landed on Tammy before and we were both excited although I was disappointed not to have gotten a picture.. When another group of Chickadees greeted us further down the trail I began searching my pockets and found the crumbs of a granola bar in an old wrapper deep in my pocket. With this offering Tammy was able to have multiple Chickadees land on her hand and this time I was ready with my camera to capture the magic moments. To our mutual surprise and delight a White-breasted Nuthatch also alit on Tammy's out-stretched fingers, instantly becoming our new favorite bird! I was also able to offer a few crumbs to our new feathered friends and the birds blessed me with finger-perching magic moments as well. Both the Chickadees and the Nuthatch made visits to my hand. We later saw other park visitors hand-feeding the birds and it's apparently well documented behavior for the Hendrie Valley Sanctuary Chickadees and Nuthatch's so be sure to take some wild-bird seed or bird-friendly sunflower seeds with you if you visit the park. And be sure to have your camera ready to record the magic miracle moment when a wild bird chooses to land on you. I personally found it to be a very humbling moment, one I'm very grateful for. In addition to Black-capped Chickadee, White-breasted Nuthatch and Red-tailed Hawk we also saw a number of other bird species... Great Blue Heron, Sharp-shinned Hawk, Northern Cardinal, American Black Duck, Mallard Duck, Downy Woodpecker and thankfully just one House Sparrow. (I say thankfully because House Sparrows are one of the most damaging introduced invasive species to ever blight our shores. More about that in a future blog.) We also saw a couple of species which were kind of surprising considering what time of year it is... Redwing Blackbirds and American Robins. It's not uncommon to see the occasional Robin around at this time of year, especially when the weather has remained relatively mild through the fall as it has this year but seeing a flock of robins is definitely out of the ordinary. They've usually all split to warmer climes in the south by now so encountering a flock of them at Hendrie Valley was a bit of a shock. It's interesting to note they all appeared to be young birds so maybe they just don't get that being Robins, they're supposed to fly south for the winter. It's not inconceivable that successive seasons of warming temperatures could temper a migratory bird's inherent genetic urge to move south. It has been unseasonably warm, who wouldn't want to skip school (or work) to enjoy a day off in the park? 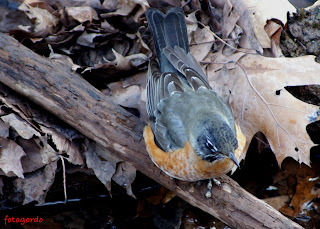 Perhaps the flock of young Robins we saw skipped the class on migrating at bird-school back in August. We also saw a couple of young Redwing Blackbirds which was even more surprising than seeing Robins. We haven't seen Redwing Blackbirds around for almost a month. The two we saw at Hendrie Valley were both still sporting the spots identifying them as young birds. They were huddled deep inside some trail-side shrubbery, puffed up against the cold despite it being one of the warmest days we've had of late. They didn't look happy at all to be there. I don't have much hope for a happy ending for them. With the temperature drop overnight, the snow and high winds... conditions are far worse than they were yesterday. If those Blackbirds were having a hard time then it must be seriously discomforting, maybe even life-threatening to them today. Putting aside any concerns about the young Blackbirds we saw in Hendrie Valley Sanctuary yesterday's adventure was definitely among the year's favorite outdoor excursions. In the almost 3 hours we spent at the park we didn't see all of it but what we did see was enough to ensure we will be visiting again and again. I recommend the park to anyone looking for an interesting easy-to-access nature experience. We look forward to seeing the park through its upcoming seasonal changes and I'll probably shoot thousands of photos there over the next year. (I shot almost 400 on Friday.) It's a beautiful spot, another natural wonder practically in our backyard. At a cost of $1 and hour, it's hard to find a more economical spot for anyone (especially families) to enjoy a day in the great outdoors. I saw no designated picnic areas in the park but there are plenty of areas where a group could sit and eat lunch. There are no garbage cans in the park though so be prepared to carry out whatever you carry in. And speaking of garbage... we saw very little trash at Hendrie Valley which was a pleasant surprise since littering is so prevalent these days. Perhaps its close proximity to RBG headquarters ensures the Sanctuary gets a little more attention than some of the other wilderness areas where littering and trash dumping is an issue. Like in all other RBG wilderness areas bicycles are NOT permitted on any of the trails in Hendrie Valley Sanctuary and we saw no evidence people were riding bikes within the park boundaries (unlike other areas like Princess Point where cyclists regularly ignore such rules much to the detriment of the natural terrain and enjoyment of pedestrian park users. No doubt the subject of another future blog) Again, maybe it's the closeness to Royal Botanical Gardens which helps keep bicycles out of Hendrie Valley. It may be that regular park users police it themselves or maybe bike riders shun it because the trails offer no route that is easier or shorter than pedaling around it on city streets. Whatever the reason, this RBG wilderness area is refreshingly free of bicycle traffic and for that alone is warrants a high-enjoyability ranking. Take nothing but photographs and memories.